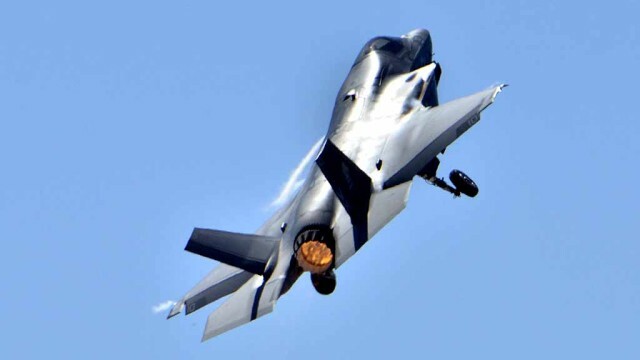 The Marines’ newest jet, the Lockheed Martin F-35B Lightning II, will for the first time take part in the giant annual “Red Flag” exercise over the Nevada desert. The Marines announced Monday that Fighter Attack Squadron 121, based in Yuma, AZ, will take part in the exercise beginning Tuesday and continuing though July 29. More than 115 aircraft are scheduled to depart Nellis Air Force Base in Nevada twice a day for the exercise, which is designed to provide realistic combat training. The exercise is hosted north of Las Vegas on the Nevada Test and Training Range. The stealthy F-35 is being built in three variants for the Air Force, Navy and Marines, with the Marine version the first to be operational. It is the most expensive defense program in history. The Marine version is designed to take off and land vertically from the Navy’s amphibious assault ships, replacing the aging AV-8B Harrier jets.